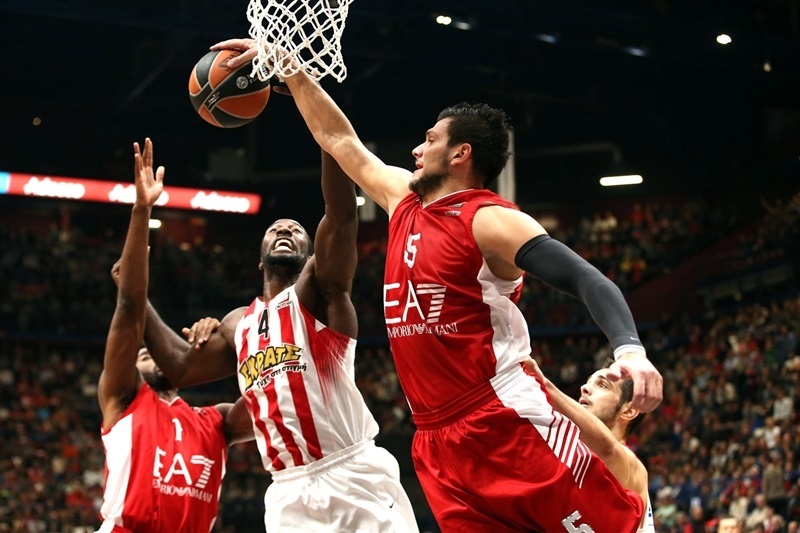 In an intense showdown that went down to the wire, Olympiacos Piraeus rallied to beat EA7 Emporio Armani Milan 66-71 on the road on Friday. 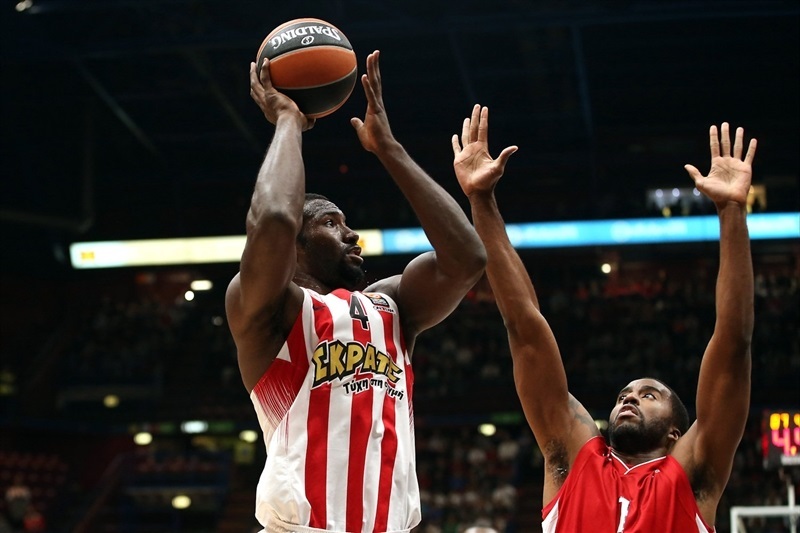 Olympiacos improved to 2-1 while Milan dropped to 1-2. 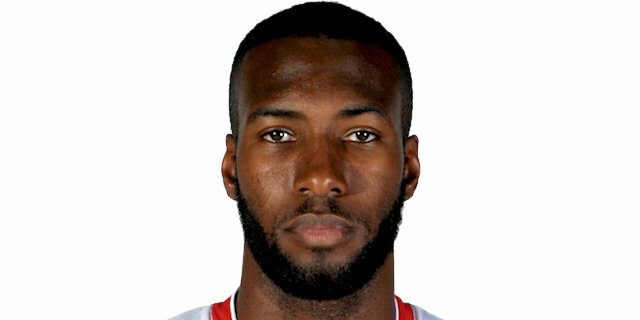 Patric Young led the winners with 18 points, Georgios Printezis added 16 while Vassilis Spanoulis had 14 for Olympiacos. Alessandro Gentile led Milan with 24 points and 7 assists and Krunoslav Simon added 11 for the hosts. An outstanding Gentile shined in the first quarter and got help from Milan Macvan and Oliver Lafayette to give Milan a 23-20 lead after 10 minutes. Matt Lojeski stepped up for Olympiacos and a tip-in by Othello Hunter made it 27-34. 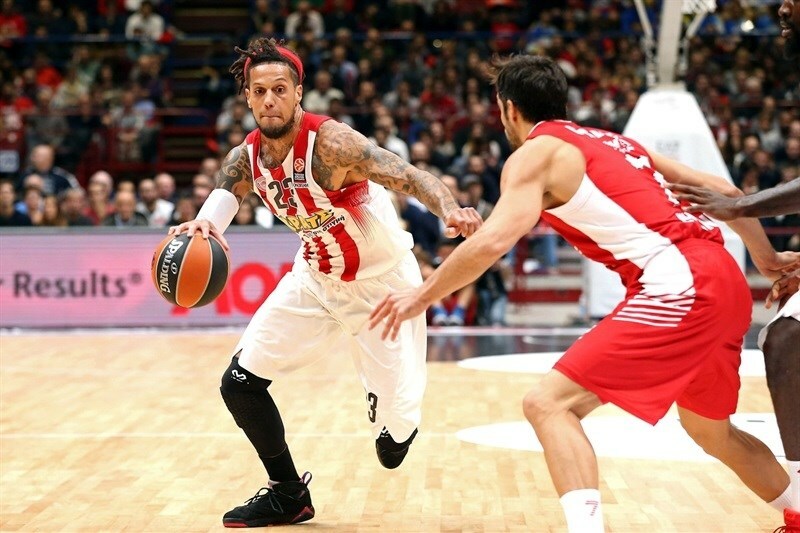 Milan managed to tie the game, 37-37, on a big three-pointer by Charles Jenkins, but a jump hook by Hunter restored a 37-39 Olympiacos edge at halftime. 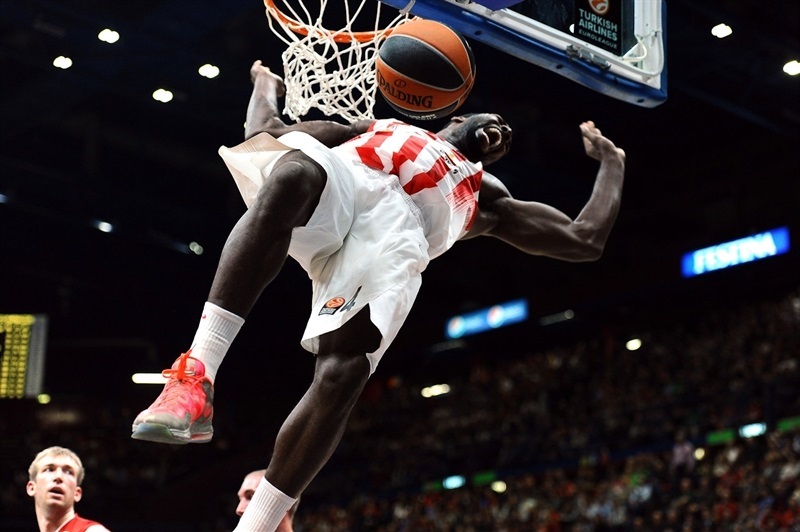 Olympiacos led most of the way in the third quarter, but a triple by Simon gave Milan a 64-62 lead after 30 minutes and another one by Gentile made it 60-54. Young, Spanoulis and Printezis fueled a 0-10 run, but a jumper by Gentile tied it at 64-64 with a minute left. A critical jumper by Spanoulis and a dunk-and-foul by Printezis sealed the outcome down the stretch. Both teams struggled to score early until Gentile fed Macvan for a backdoor layup. Printezis hit his trademark jump hook, but Gentile did better with a bomb from downtown. Young hit a jump hook and soon added a backdoor layup to tie it at 6-6. Jenkins struck from downtown, but an unstoppable Young matched that with a layup-plus-foul. 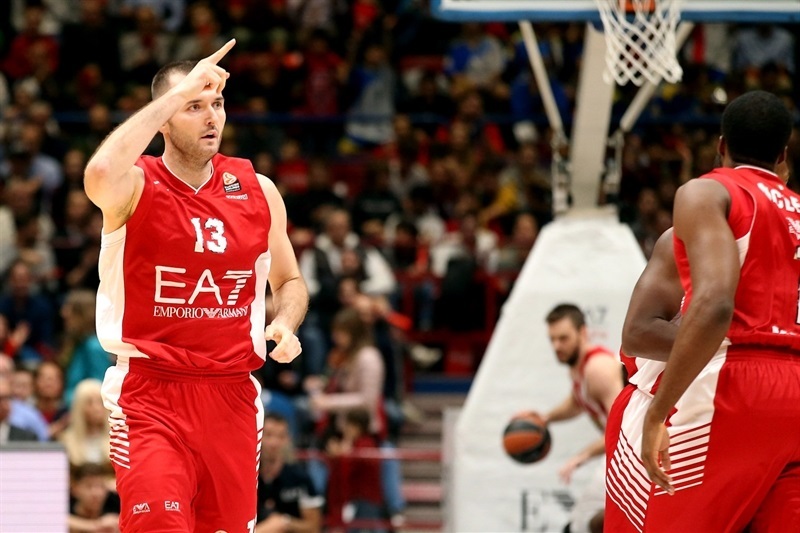 Spanoulis buried a three-pointer, but Gentile kept pushing Milan with a driving basket and a dunk by Lojeski restored an 11-14 Olympiacos lead. Gentile sank a mid-range jumper and Lafayette added a big triple off the dribble for a 16-14 Milan lead. Gani Lawal shined with a power layup and split free throws. 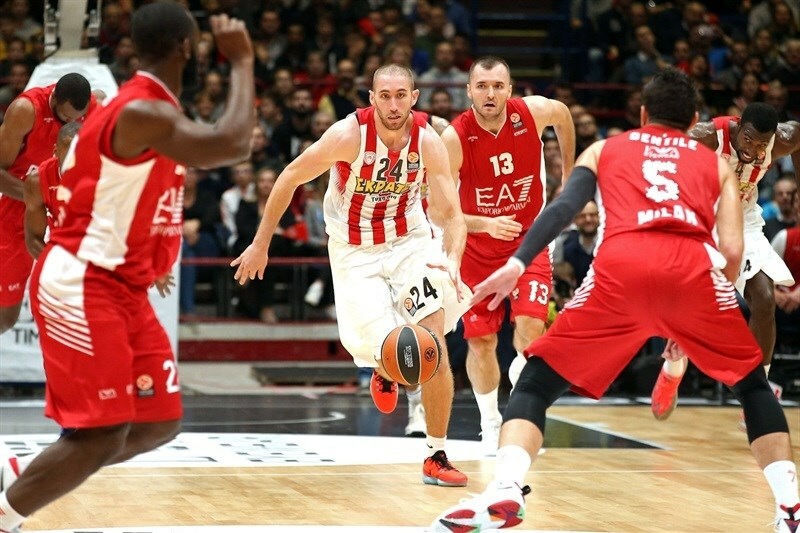 Spanoulis and Macvan traded three-pointers and a layup by Printezis kept Olympiacos within 22-20. A free throw by Gentile fixed the score at 23-20 at the end of a very exciting first quarter. Lojeski found space for an uncontested layup early in the quarter, but Gentile quickly answered with a big basket in the low post. Daniel Hackett hit a jump hook and a five-meter jumper by Lojeski put Olympiacos back ahead, 25-26. Dimitrios Agravanis split free throws and a finger roll layup by Young boosted the guests' lead to 4. 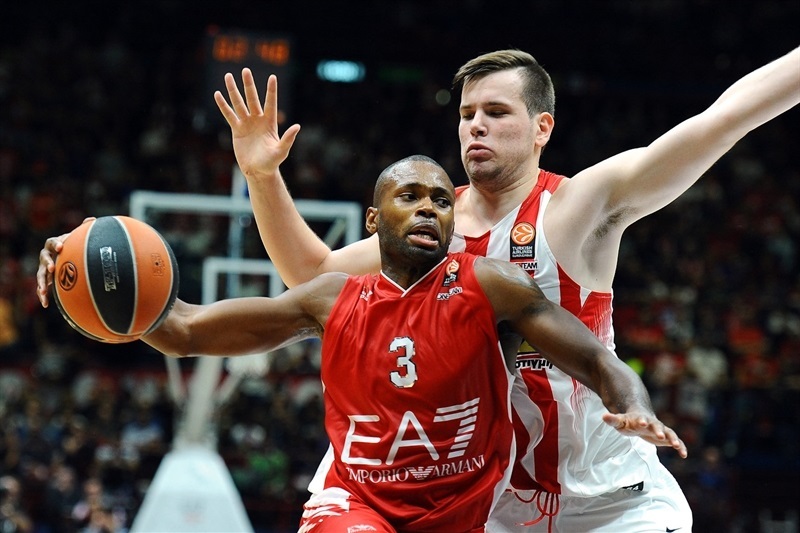 Krunoslav Simon rescued Milan with an off-balance basket and Young and Printzis set a 27-32 Olympiacos margin. Hunter shined with a tip-in, but Gentile did even better with a three-point play. Macvan made foul shots, but a three-pointer by Agravanis gave the Reds a 32-37 lead. Lafayette scored in penetration and a three-pointer by Jenkins ignited the crowd and saw Olympiacos call timeout at 37-37. Hunter stepped up with a jump hook to give Olympiacos a 37-39 lead as both teams headed back to the locker rooms. Gentile scored around the basket right after the break and a free throw by Young gave Olympiacos a 39-40 lead. Jamel McLean stepped up with a big slam for his first points, which Printezis erased with a big basket in the low post. Both teams went scoreless for a couple of minutes until Young took over with a layup - and the free throw that came with it – for a 41-45 Olympiacos lead. Hackett made free throws and Gentile split attempts. Stanko Barac brought Milan within 43-47. 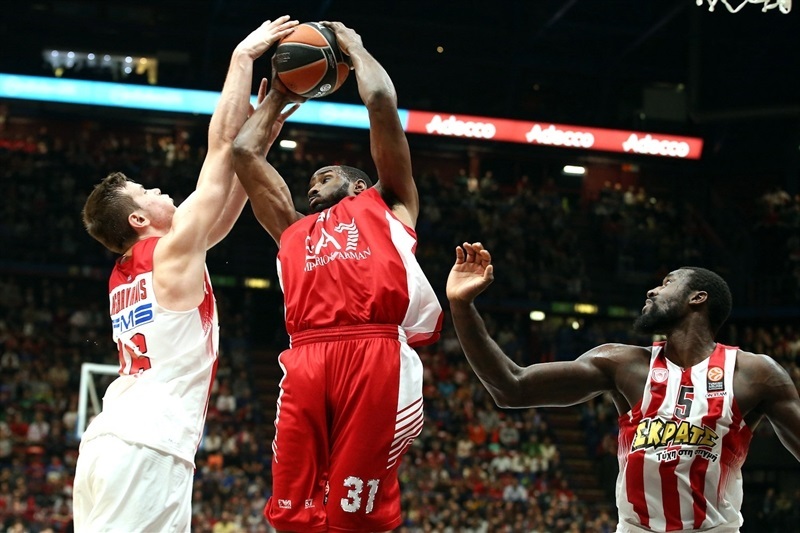 Jenkins shined with a big basket in penetration, causing Olympiacos to call timeout. Hackett hit more foul shots, but Simon did better with a big three-pointer that brought the crowd to its feet at 48-49. 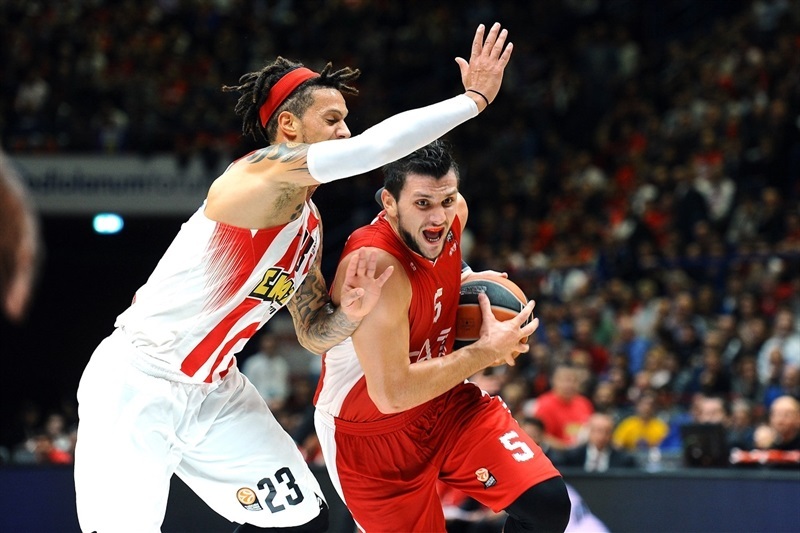 Olympiacos struggled to get Lojeski involved, but Hackett kept pacing the Reds with a wild three-point play. Robbie Hummel hit a three-pointer from the right corner and Simon did the same from the left corner to regain the lead, 54-52, for Milan through three quarters. 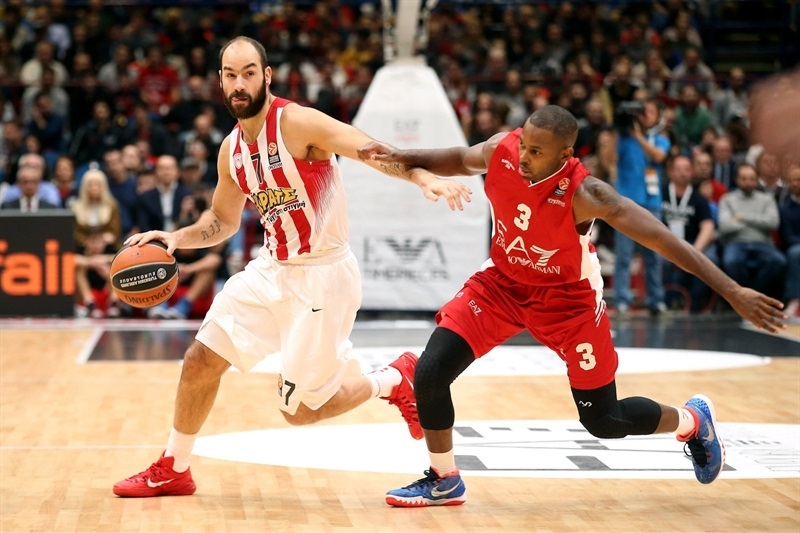 Simon hit a technical free throw early in the fourth quarter, as Olympiacos kept struggling to score without Spanoulis on court. Gentile swished a mid-range jumper that made it a five-point game. Printezis stepped up with another jump hook, which Gentile bettered with a wild three-pointer. Spanoulis answered from downtown and a high-flying put-back slam by Young brought Olympiacos as close as 60-59. Printezis buried a critical three-pointer which gave the guests a 60-62 edge with four minutes left. Milan kept struggling to score when it mattered most and called timeout to get Gentile and Simon involved. Meanwhile, free throws by Young capped a 0-10 Olympiacos run, 60-64. Milan had been held scoreless for almost six minutes until Simon stepped up with a layup. A step-back jumper by Gentile tied the game at 64-64. Spanoulis hit a five-meter jumper already in the final minute and a dunk-and-foul by Printezis sealed the outcome, 64-69, with 7.6 seconds left. "I think we played much better defense in the second half. We did well on defense except in the first quarter, in which we allowed 23 points. We played good defense and controlled the game. They scored 66 points at home and I think that was the key to win this game. On offense, we had some good moments and some others in which we have to improve our game. 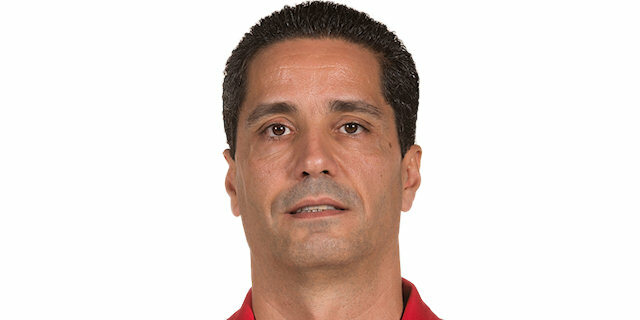 It is early in the season and of course, with the new players that we have, we need to improve our game and offensively, to read the game better and get good options to shoot." "I just want to tell every young baller and basketball player in the world that basketball starts with your preparation. I think I did a very good job preparing and practicing, getting extra shots and working on my form, so when I came to the game, I had confidence to take these shots; I made almost every shot tonight. Spanoulis told me right when I came here 'just follow me and the ball will be in your hands'. He hasn't fallen short of that yet."